A school bus is a motor vehicle, which carries students to and from educational institutions. A vehicle is usually not considered to be a bus unless it can carry at least 10 passengers. About 85% of all school buses in the United States weigh more than 10,000 lb (4,500 kg) and carry more than 16 passengers. Before the development of motor vehicles, horse-drawn vehicles were used for public transportation. Horse-drawn buses, which could carry 25 to 50 passengers, were used in France as early as 1828. In 1830, the British inventor Sir Goldworthy Gurney designed a bus, which was powered by steam. Despite the early invention of steam-powered vehicles, horse-drawn vehicles continued to be the most important form of public transportation throughout the nineteenth century. In New York City in 1832, metal rails were first installed to allow horse-drawn vehicles to roll more smoothly over rough city streets. These rails were later used for steam-powered cable cars, steam locomotives, and electric trains. These vehicles, which were limited to fixed routes because they had to follow the rails, were the dominant form of urban transportation until motor vehicles became popular in the early twentieth century. Long before this happened, however, public schools began to provide transportation systems for their students. The first act of legislation in the United States providing for pubic funds to transport students to and from schools was enacted in Massachusetts in 1869. Usually, local farmers were paid by the state government to carry students in horse-drawn wagons. Vermont passed a similar law in 1876, followed by Maine and New Hampshire. By 1900, eighteen states had such laws, and by 1919 all 48 states had them. Two factors led to the passage of these laws, which led in turn to the increasing use of school buses. First, compulsory attendance laws required all children to go to school. Second, consolidation laws changed education in rural areas by eliminating small local schools in favor of large central schools, which could provide improved education to more students. The need to transport all children to school, combined with the fact that rural schools now served a much larger area, made school buses a vital part of public education. During the nineteenth century, the vehicles used to transport students were known as school wagons. The earliest school wagons were simply wooden farm wagons. Later, canvas tarpaulins were used to cover the wagons in order to offer protection from the weather. Stoves were used to heat the wagons in winter. Meanwhile, motor vehicles began to replace horse-drawn vehicles. In 1860, the Belgian mechanic ttienne Lenoir developed the internal combustion engine. In 1885, the German engineers Karl Benz and Gottlieb Daimler independently used improved internal combustion engines to produce the first automobiles. Automobiles were produced in many European countries and in the United States by the 1890s. In Germany, an internal combustion engine was used to power a bus, which carried eight passengers in 1895. In the same country in 1896, Gottlieb Daimler built the first motor truck. Trucks and buses were built using the same type of chassis (the lower part of a motor vehicle, which is connected to the engine and which propels the vehicle) until the 1920s. In 1921, the Fageol Safety Coach Company of Oakland, California, introduced a special bus chassis, which was wider, longer, and lower than a truck chassis. Although this design soon became the standard for other kinds of buses, school buses are still manufactured using a chassis similar to a truck chassis. In 1913, American automobile manufacturer Henry Ford revolutionized the industry by introducing the assembly line. Instead of being built one at a time from start to finish, automobiles could now be assembled from standardized parts as the chassis was pulled along by moving assembly belts. This method allowed automobiles to be made in larger numbers, more quickly, and less expensively. Motor vehicles were transformed from luxuries for the rich to affordable transportation for the middle class. By the end of the 1920s, motor vehicles, including school buses, had almost completely replaced horses as a method of transportation. During the early twentieth century, school buses often consisted of a wooden body attached to a steel chassis. During the late 1920s, steel bodies replaced wooden bodies, resulting in vehicles similar to modern school buses. School buses became even more important to public education during the second half of the twentieth century, as school consolidation continued. Between the end of World War H and the early 1970s, the number of school districts in the United States decreased from more than 100,000 to about 17,000. By the late 1980s, more than 22 million students in the United States were transported on school buses each school day. The United States public school bus system is now the largest public transportation system in the world. The most important raw material used to manufacture school buses is steel, which is an alloy of iron and a small amount of carbon. Steel is used to make the chassis and the body, along with various other components. Steel is made from iron ore, coke (a carbon-rich substance produced by burning coal in the absence of air), and limestone. The coke provides the carbon, which transforms the iron into steel, and the limestone reacts with impurities in the ore to remove them in the form of slag. Oxygen is then blasted into the molten mixture to remove excess carbon and other impurities. The windows of a school bus are made of laminated glass. Laminated glass consists of two layers of glass surrounding a layer of plastic. The plastic holds the glass in place if the window is broken, adding to its safety. The tires of a school bus are made from a mixture of natural or synthetic rubber, carbon black, sulfur, and other chemicals, which determine the characteristics of the tires. Natural rubber is obtained from latex, a liquid produced when the bark of a rubber tree is cut. Synthetic rubber is produced from chemicals obtained from petroleum. Carbon black is made by burning petroleum or natural gas in a limited supply of air, resulting in a large amount of fine soot. Other raw materials used in school bus manufacturing include various metals and plastics. These are used to make the many small parts, which are assembled together with the chassis and the body to make up the completed vehicle. 1 A school bus is made of hundreds of different components. Many of these components are premanufactured by companies other than the school bus manufacturer. Some components are premanufactured by companies that are owned by the school bus manufacturer. The chassis is assembled and the body formed. After the body has been assembled, it is painted. liquid tin causes the molten glass to be transformed into a solid with a flat, smooth surface as it cools. The glass is then quickly heated and cooled to strengthen it, a process known as tempering. Two layers of the tempered glass are bonded to a layer of clear, hard plastic under heat and pressure to form laminated glass. 3 Tires are made by mixing rubber, carbon black, sulfur, and other chemicals together and heating the mixture to form a single compound. Sheets of this rubber compound are wrapped around a rotating drum and glued together to form a tire without treads. This preliminary tire, known as a green tire, is made up of many layers of the rubber compound of many different shapes. The green tire is then placed in mold, which contains treads on its inner surface. An inflatable bladder is placed inside the tire. The mold is closed and the bladder is filled with steam. The heat and pressure of the steam causes the green tire to take on the shape of the tread pattern inside the mold. The bladder is deflated, the mold is opened, and the treaded tire is allowed to cool. 4 Small metal components are made by using a variety of precision metalworking machines such as drills and lathes. Some metal components, such as those made of aluminum, may be made by melting the metal, pouring it into a mold in the shape of the desired component, and allowing it to cool. 5 Plastic components may be made by injection molding. This process involves melting the plastic into a liquid and forcing it into a mold under pressure, where it cools into the desired component. 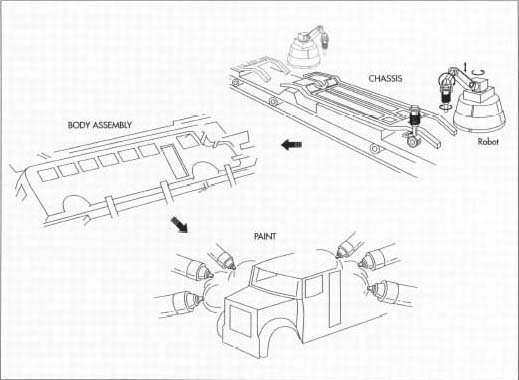 Once assembly of all parts is complete, the chassis and body are put together. 6 Steel arrives at the school bus factory in the form of sheet metal of the desired thickness. Various cutting and stamping tools are used to produce pieces of steel of the proper shape and size. These various pieces are bolted together as the chassis moves along an assembly line. 7 The frame (the base of the chassis) is bolted together from pieces of steel as assembly begins. As the frame proceeds along the assembly line, the suspension system is attached. Next, the brake and exhaust systems are attached. The engine is then installed, followed by the drive shaft and the wheels, including tires. The motorized part of the school bus is now completed. A temporary driver's seat can be attached at this point to allow the chassis to undergo a preliminary driving test. 8 Like the chassis, the body of a school bus is made of components, which have been molded from sheets of steel of the proper thickness. The various pieces of steel are bolted together or welded together as the body proceeds along an assembly line similar to the chassis assembly line. 9 Steel panels are assembled together to form the bottom, sides, and top of the body. The doors are then joined to the body. 10 The body is cleaned with soap and water, then treated with phosphate to protect it from rust. A coat of primer is sprayed on the body and baked dry in a large oven. Next, a coat of paint is sprayed on and baked dry in a similar manner. 11 Windows are installed in the body. Interior components such as the instrument panel and the seats are then installed. External components such as the door handles and lights are also installed at this point. 12 The body is lifted by a large crane and placed on top of the chassis. The two parts are then bolted together to produce the school bus. Final adjustments such as connecting the electrical wiring are made. The school bus is inspected and shipped to the consumer on special trucks designed to carry large motor vehicles. The school bus manufacturer inspects all premanufactured parts to ensure that they are free from defects. The steel sheet metal is also inspected and then kept covered during storage to protect it from corrosion. After pieces of steel are cut from the sheet metal, they are inspected to be sure that they are the proper shape and size. When the chassis is complete it is driven briefly to ensure that the motorized components operate correctly. 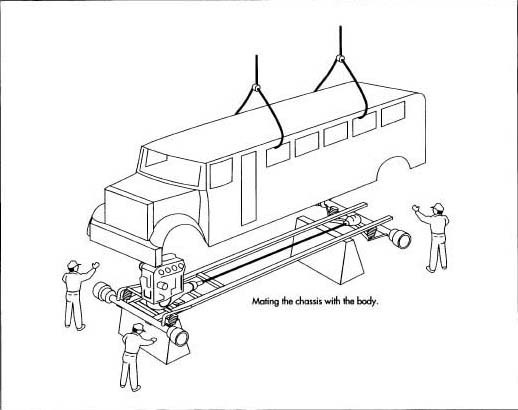 After the body is attached, the school bus is given a full road test to detect any flaws in operation. The school bus is sprayed with water to detect any leaks. The entire vehicle is given a detailed final inspection. All the items on a long, written list must be individually inspected and approved before the school bus is ready to be shipped. Safety is the major quality control concern for school bus manufacturers. The United States government has issued regulations dealing with such items as brakes, emergency exits, floor strength, seating systems, windows, mirrors, fuel systems, and the crashworthiness of the body and chassis. As a result of these regulations, studies have shown that school buses are significantly safer than other forms of transportation used by school-age children. The United States government is constantly updating safety standards for school buses. One controversial issue is the possibility of requiring seat belts on school buses. One study done in 1989 predicted that installing seat belts would cost 40 million dollars per year and save one life per year. Other possible trends include using alternate forms of energy such as natural gas or electricity ot power school buses. School buses are likely to be more comfortable as more of them are equipped with air conditioning. Safety could be improved by replacing the traditional instrument panel with an electronic display panel, which the driver could view without looking down at the dashboard. Mills, Nicolaus. "Busing: Who's Being Taken For a Ride?" Commonweal (March 24, 1972): 55-60. National Highway Traffic Safety Administration. "School Bus Safety Report," May 1993.